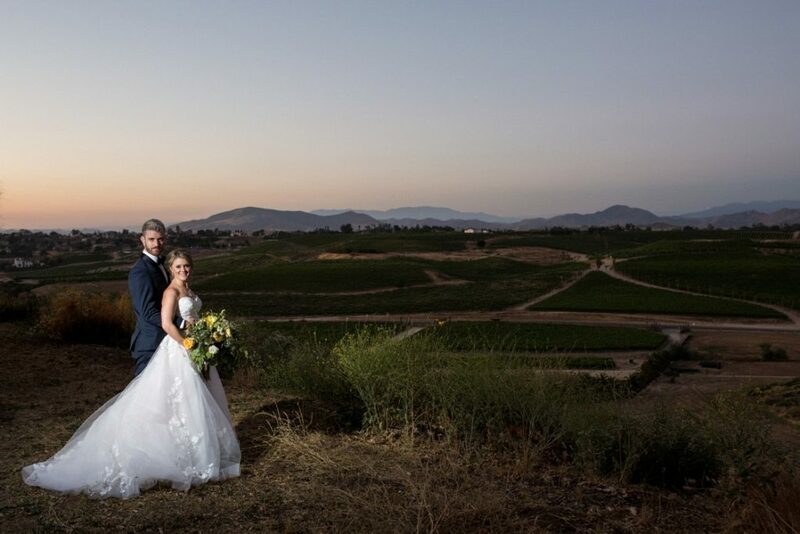 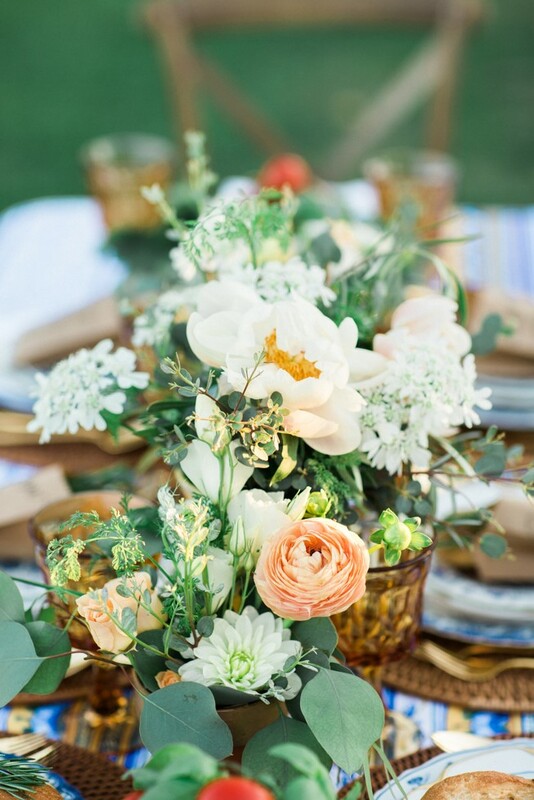 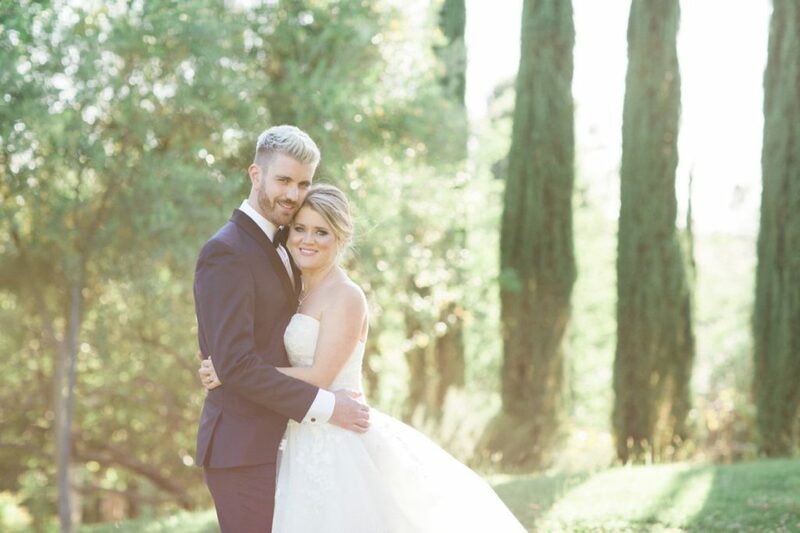 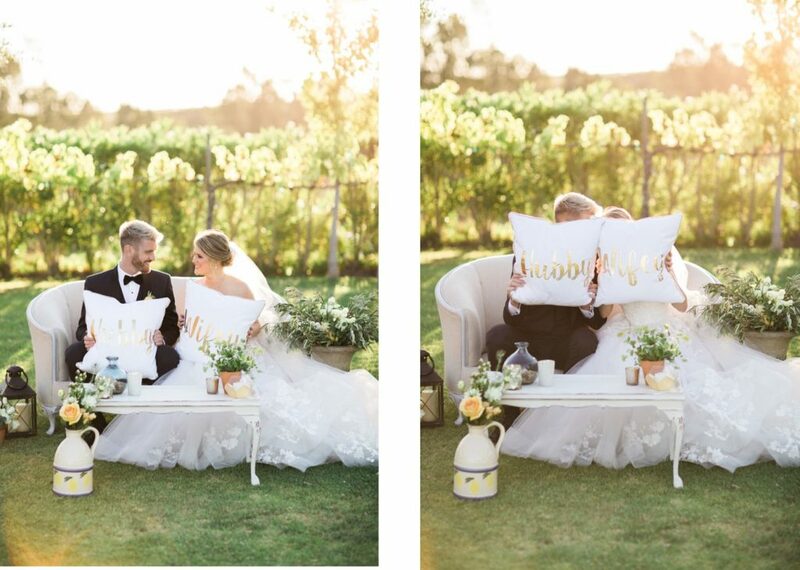 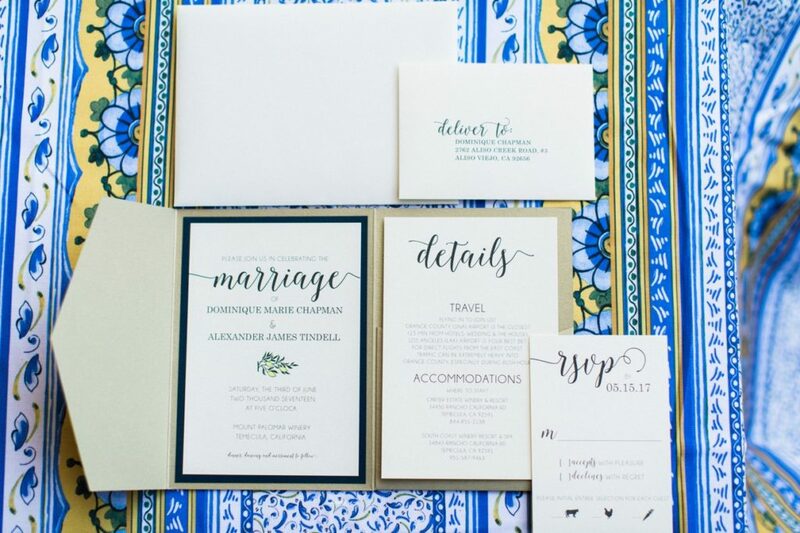 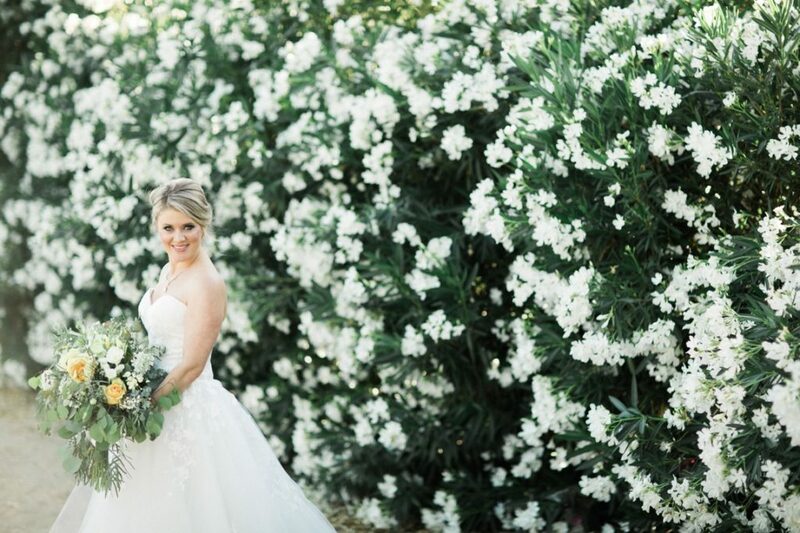 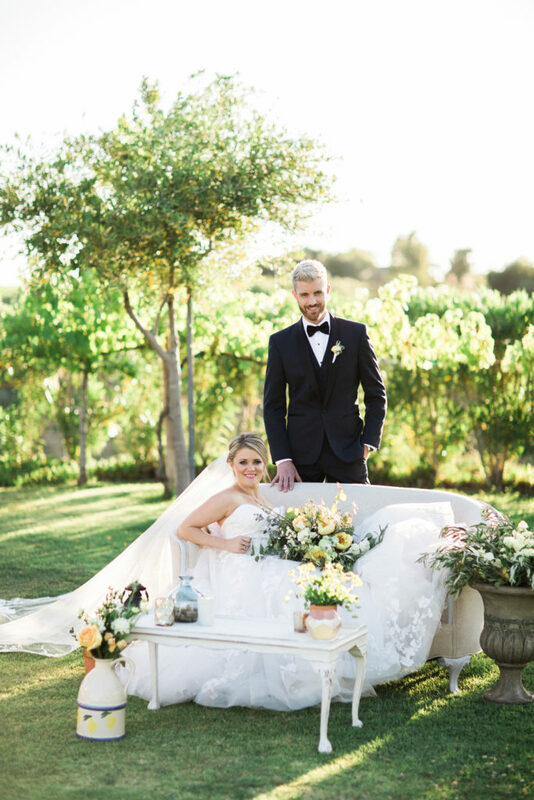 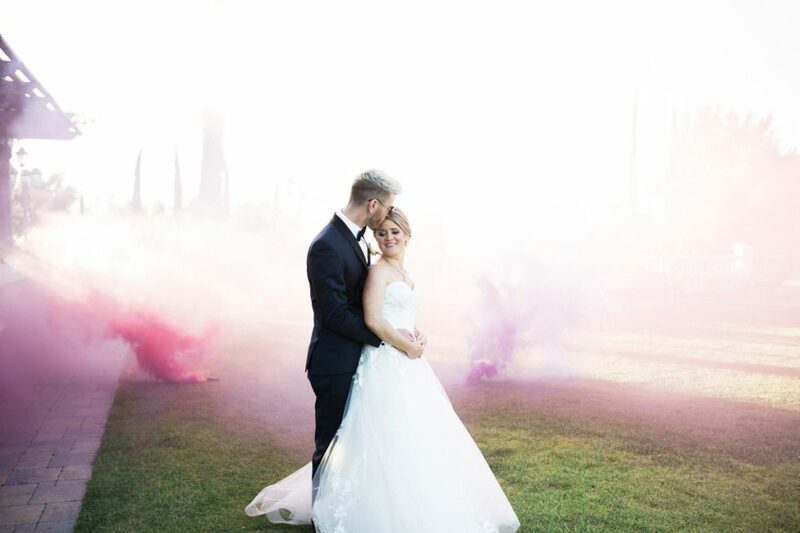 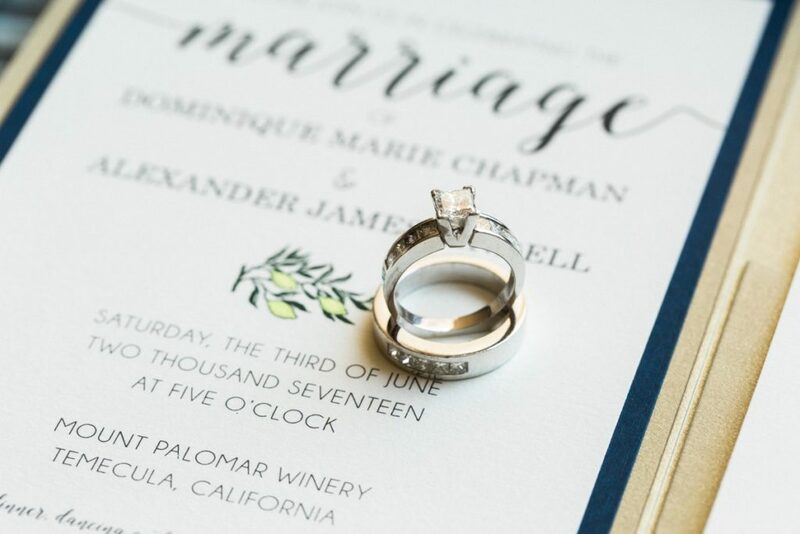 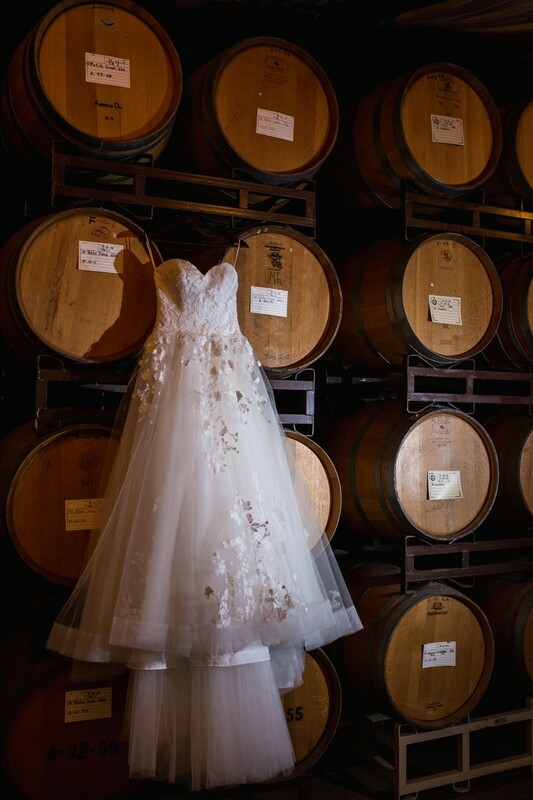 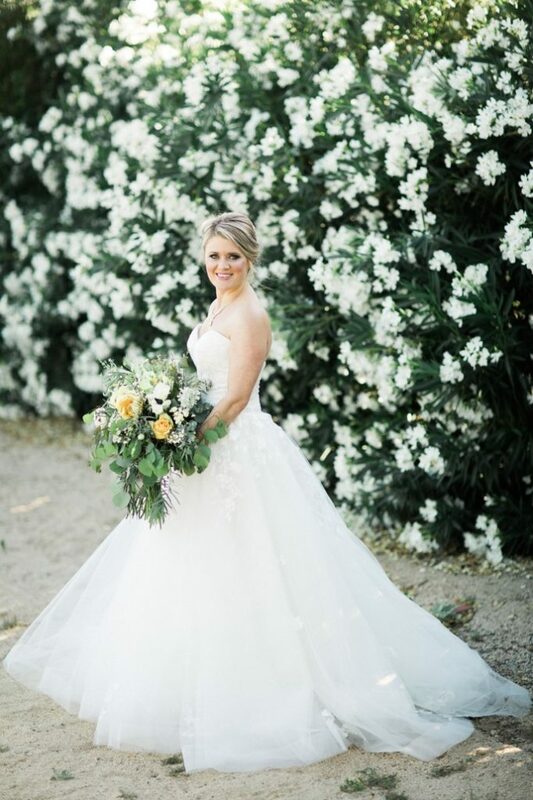 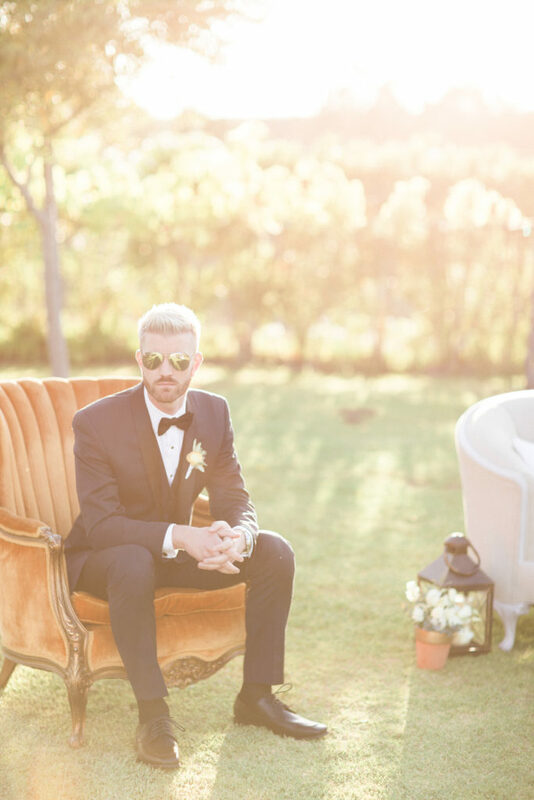 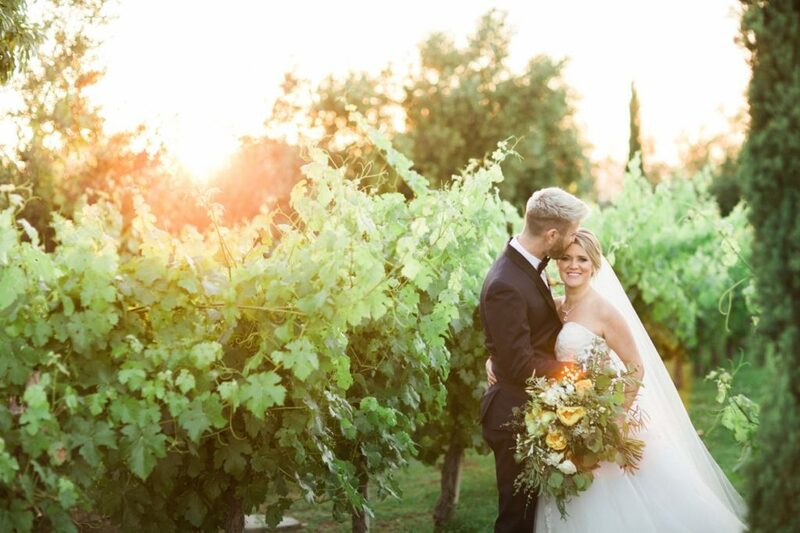 Mount Palomar Winery in Temecula, CA coordinated beautifully for this Italian styled shoot. 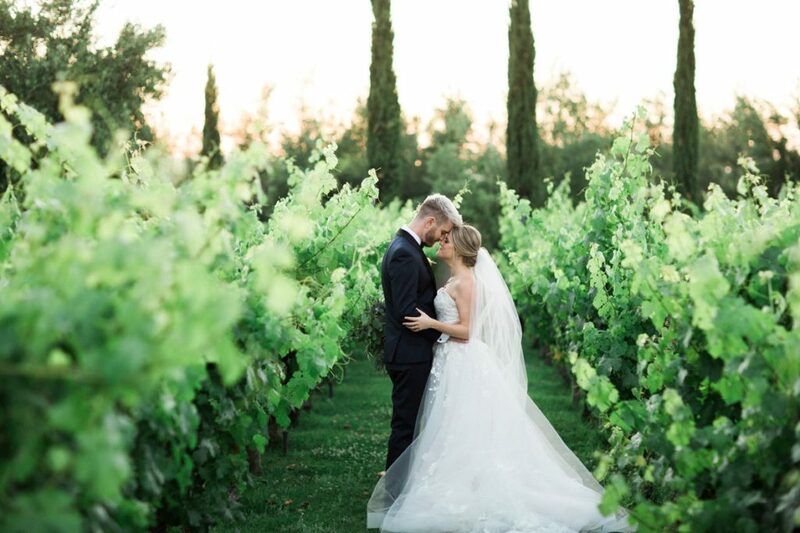 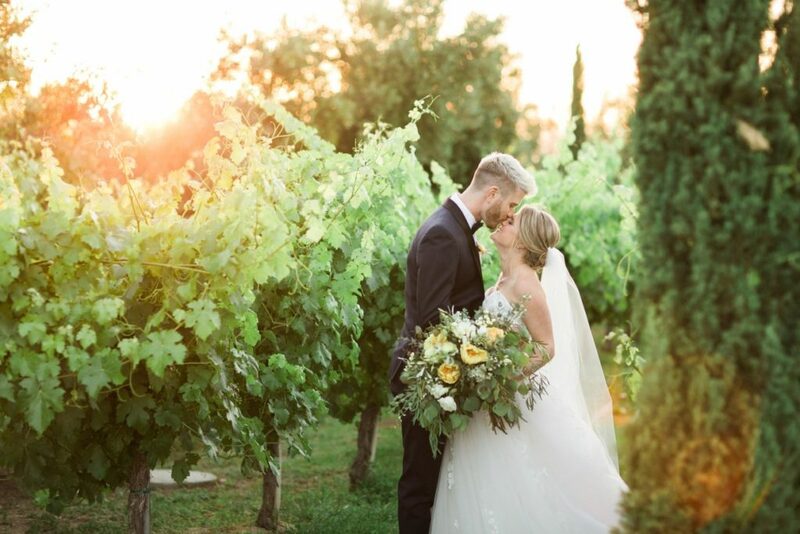 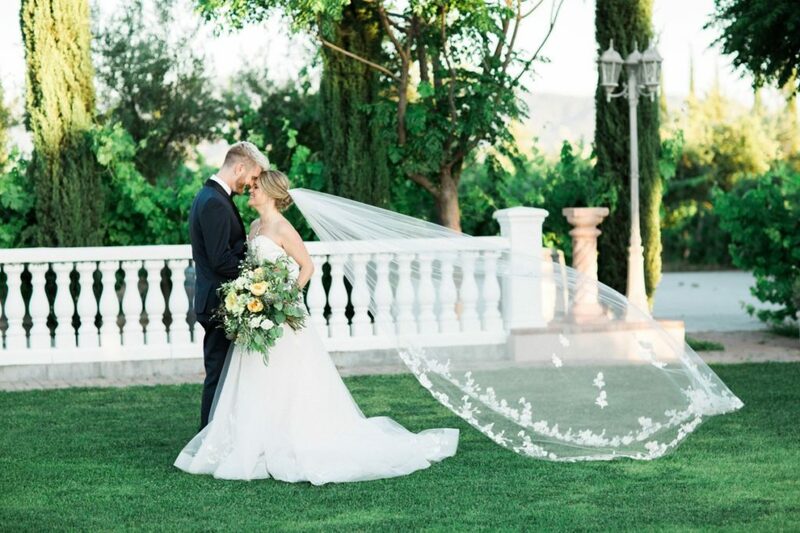 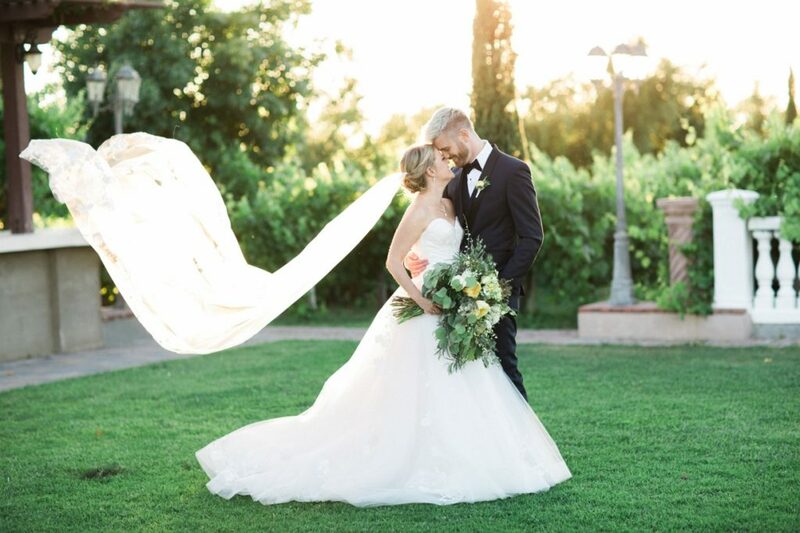 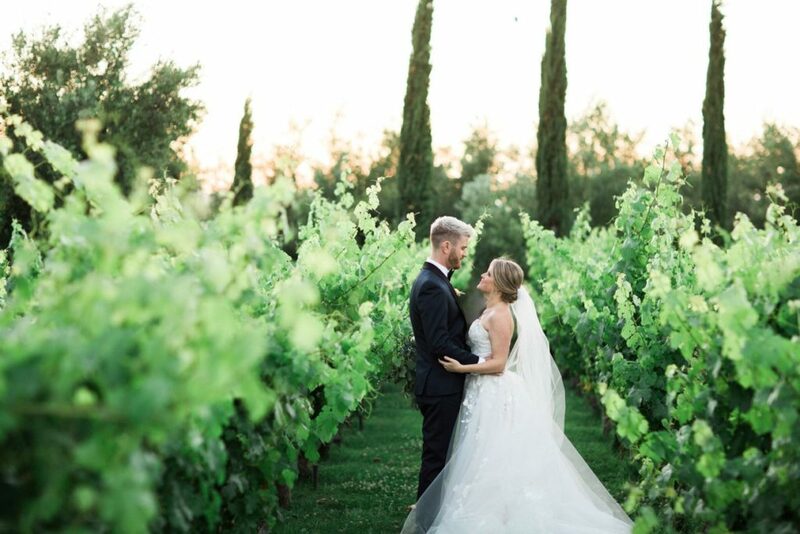 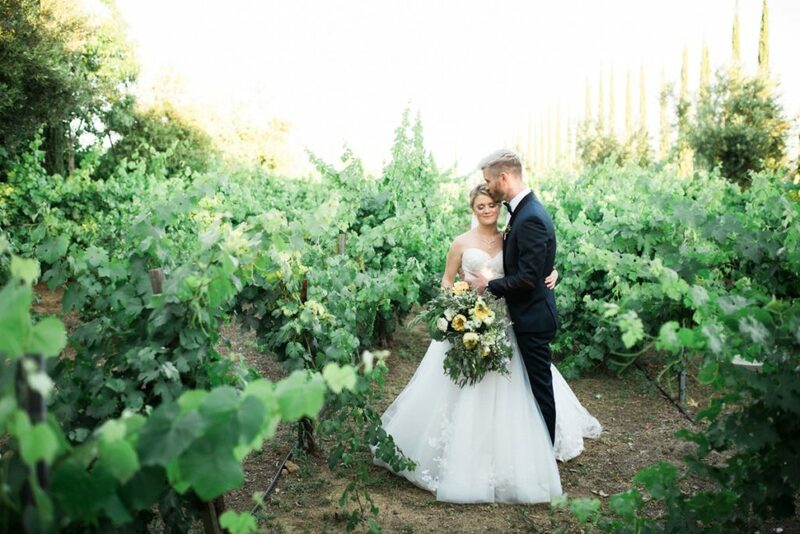 The natural beauty of rolling vineyards and tall greenery was a romantic backdrop for our model bride and groom. 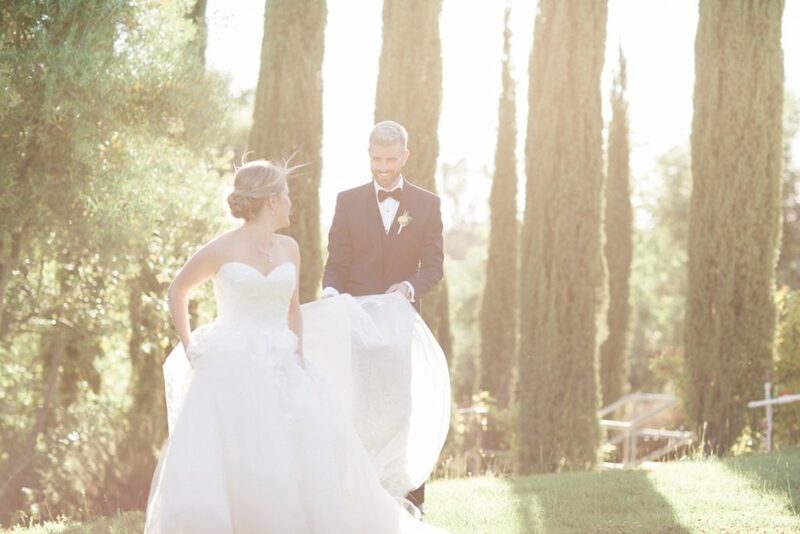 Three16 Photography did an amazing job of capturing this essence with natural light and a creative vision. 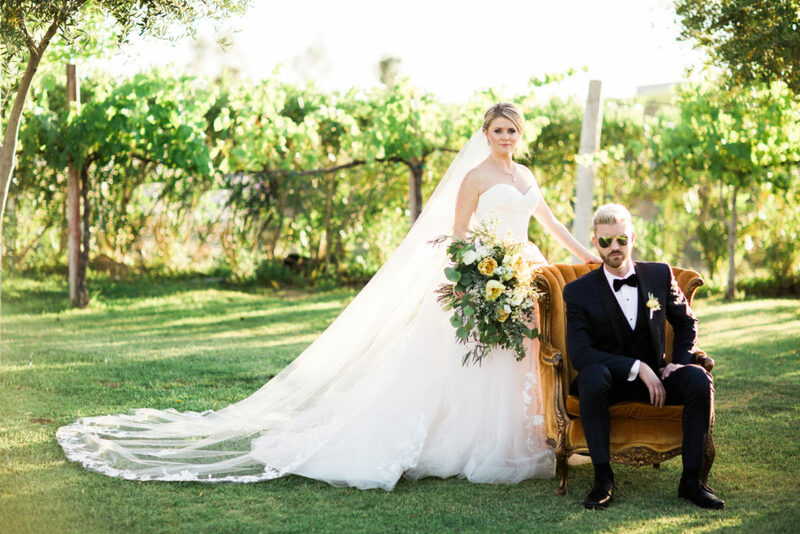 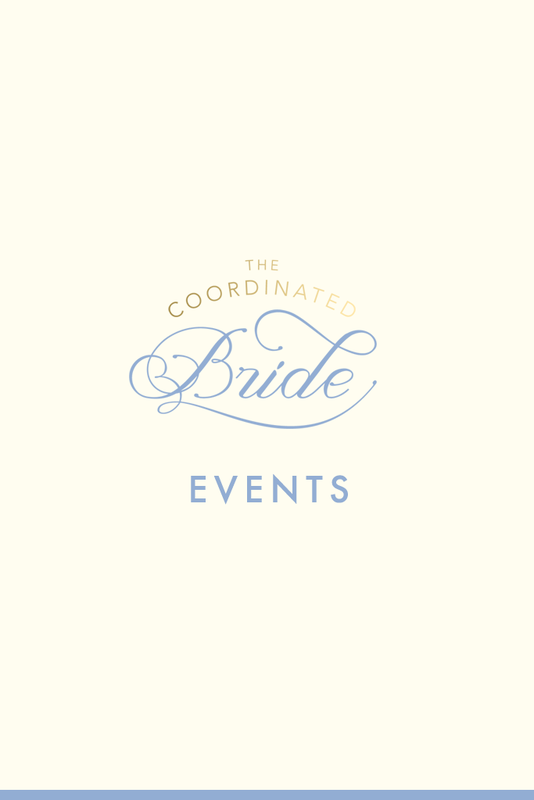 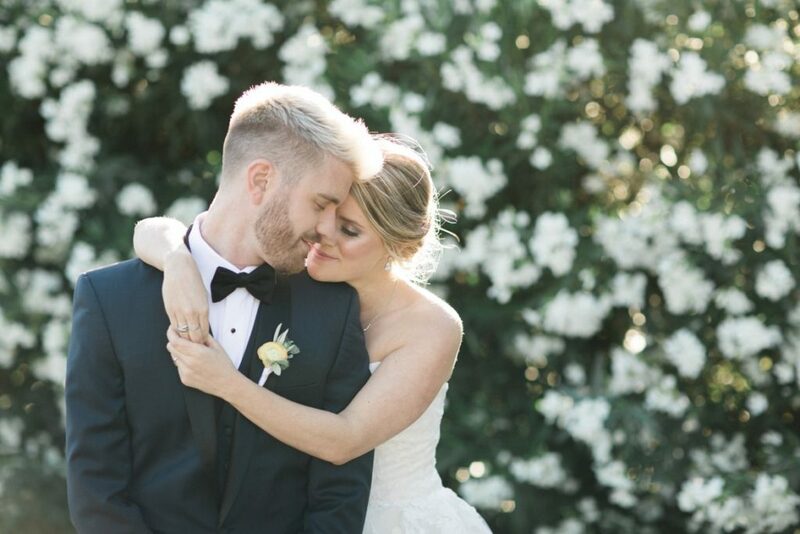 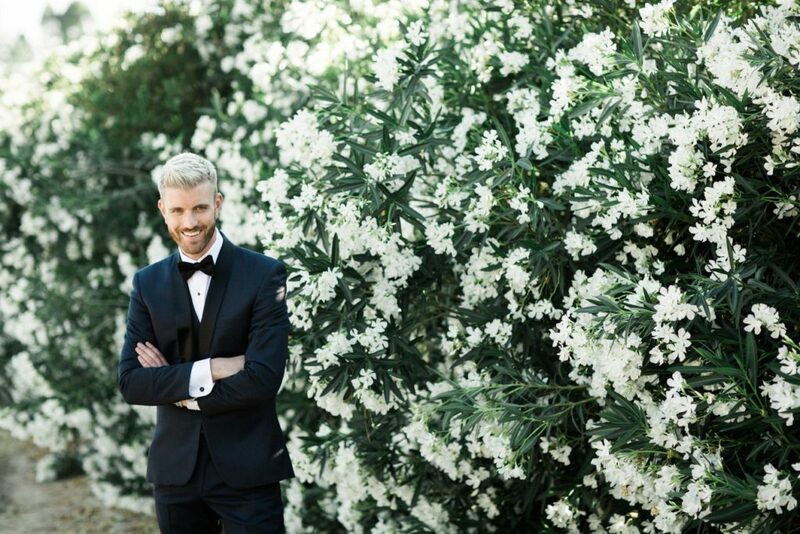 The groom was sharply dressed in a deep blue and black trimmed tuxedo from Friar Tux while the bride exuded romance with layers of lace and a dramatically long veil from Casablanca bridal. 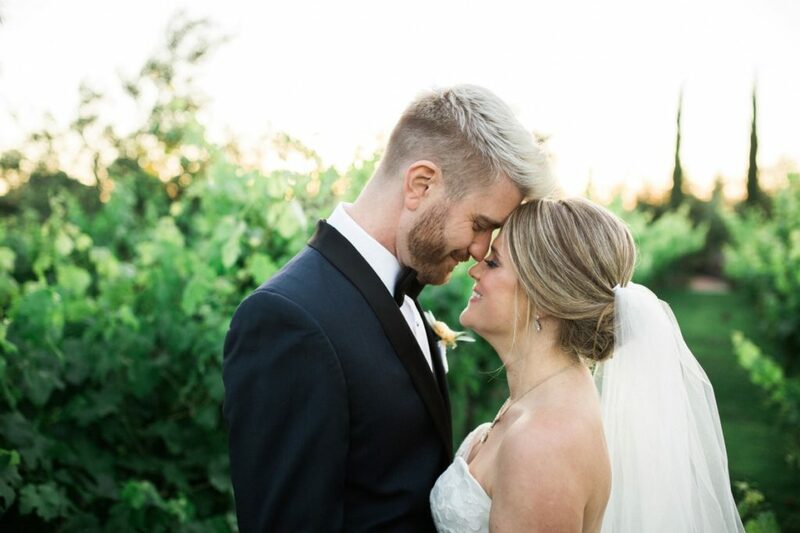 The bride’s beauty was highlighted with the makeup artistry of Domenica Beauty. 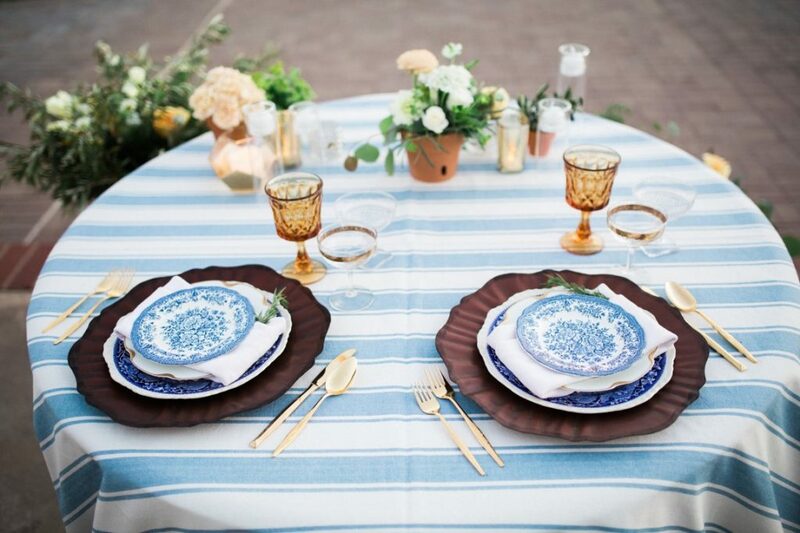 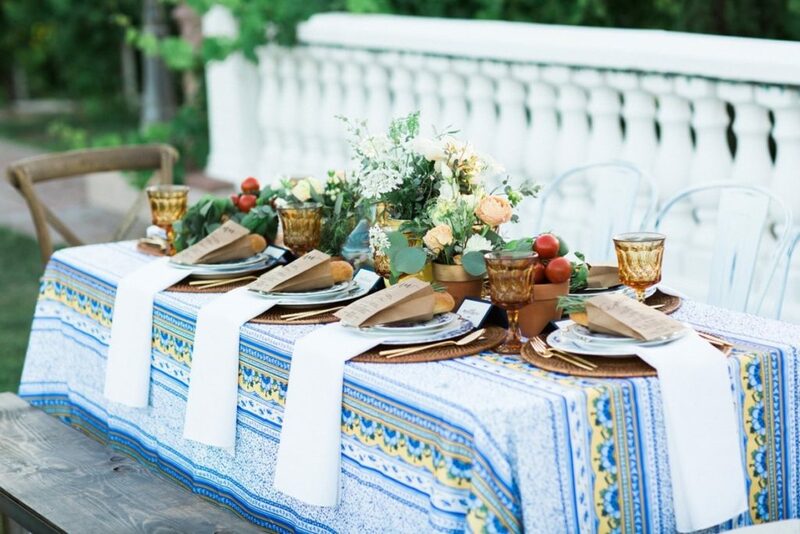 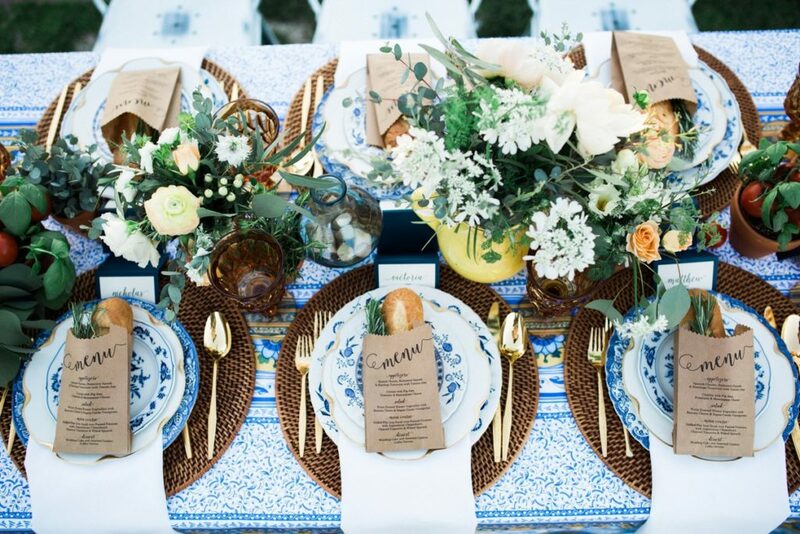 The traditional Italian tablescape showcased Tuscan inspired linens in shades of blues and yellow. 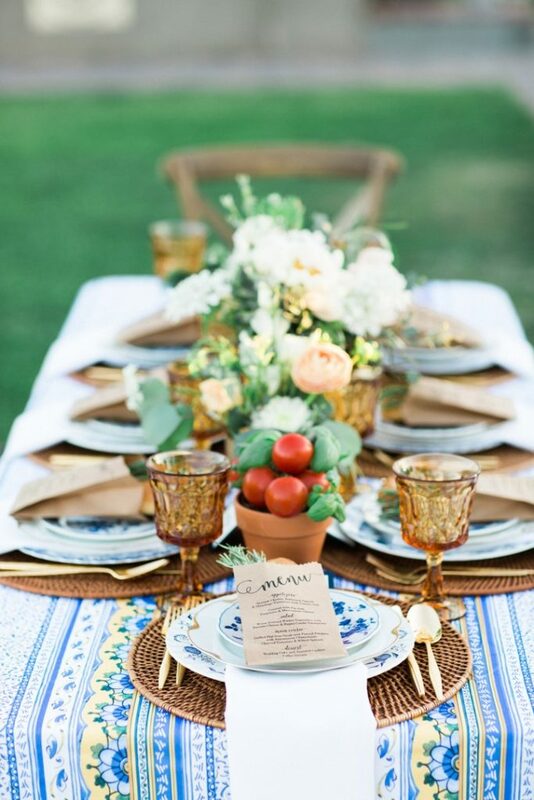 The collection was curated to accent these colors with a combination of different textures of terracotta, wicker and vintage crystal. 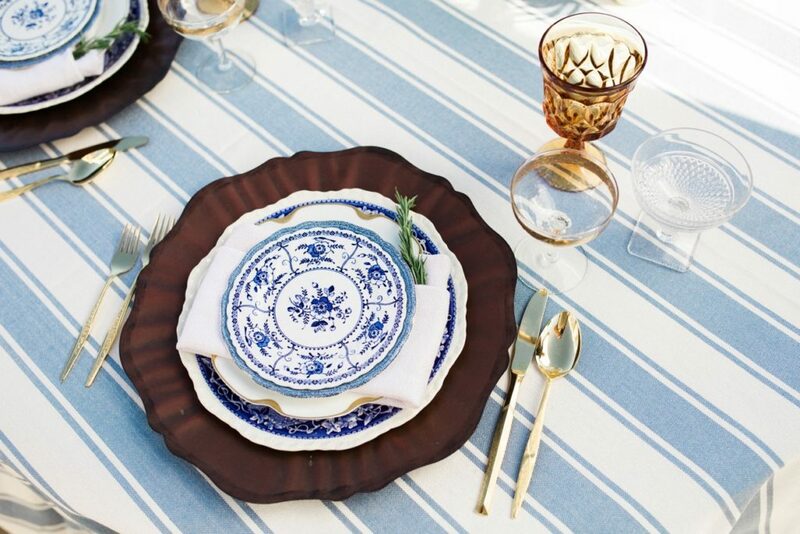 The blue and white china and amber colored goblets from Cherished Rentals were a perfect fit for this design. 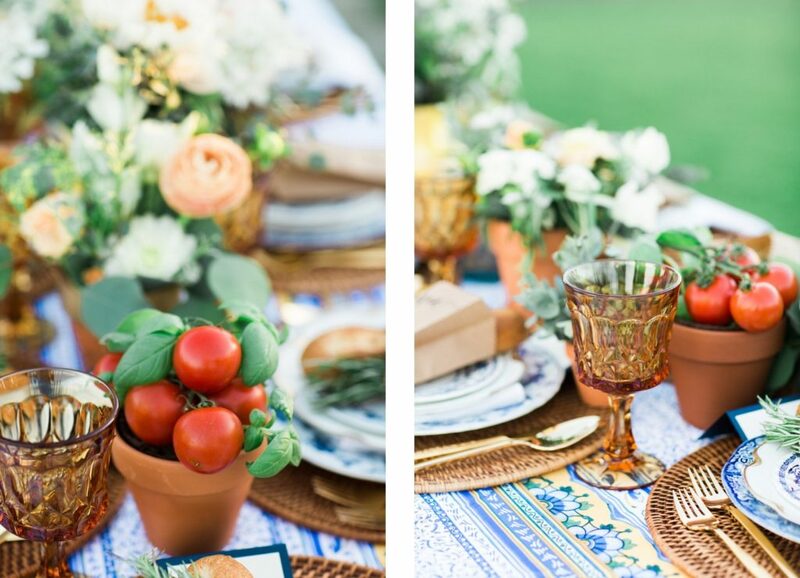 Tomatoes with basil brought color and a touch of the Mediterranean while The Pink Daffodils array of flowers of greenery, white and peach brought a soft and subtle beauty to the table. 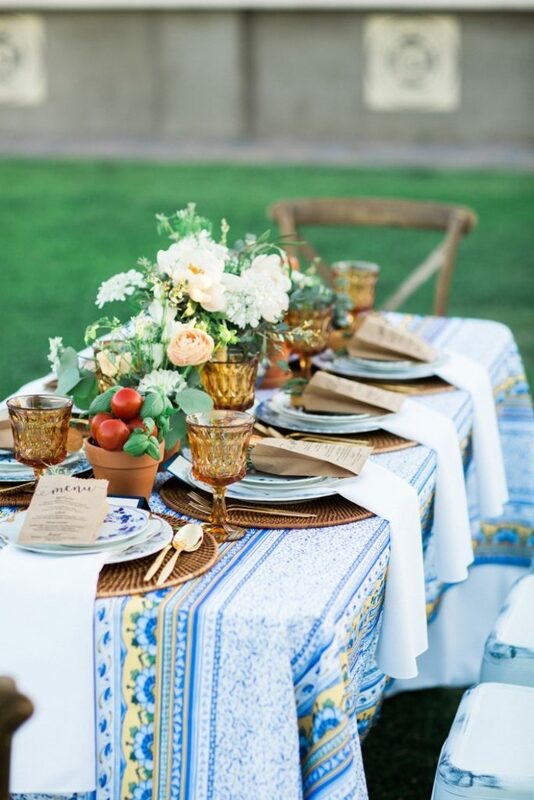 Mismatched chairs and bench from Rickety Swank and Baker Party Rental gave more character to the family dinner dynamic. 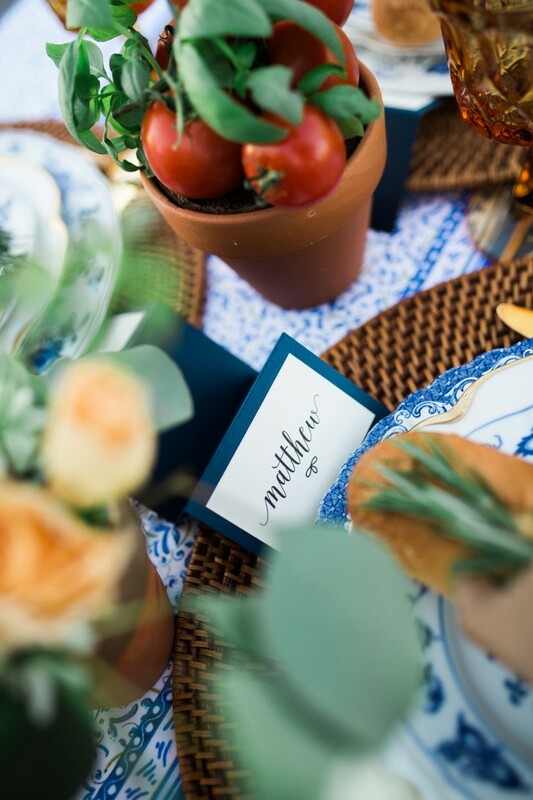 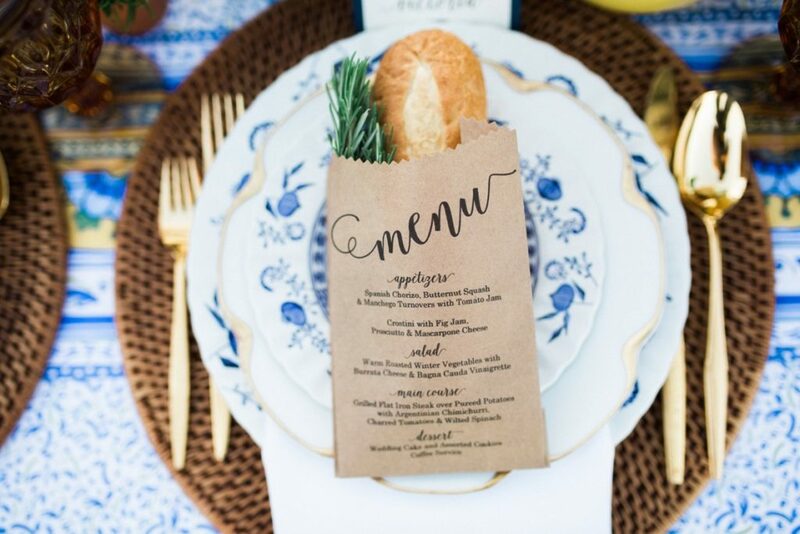 The final aspect to tie in the Italian family meal were the place cards and casual yet chic menu from Polkadot Weekend that cultivated the look with a baguette and sprig of rosemary. 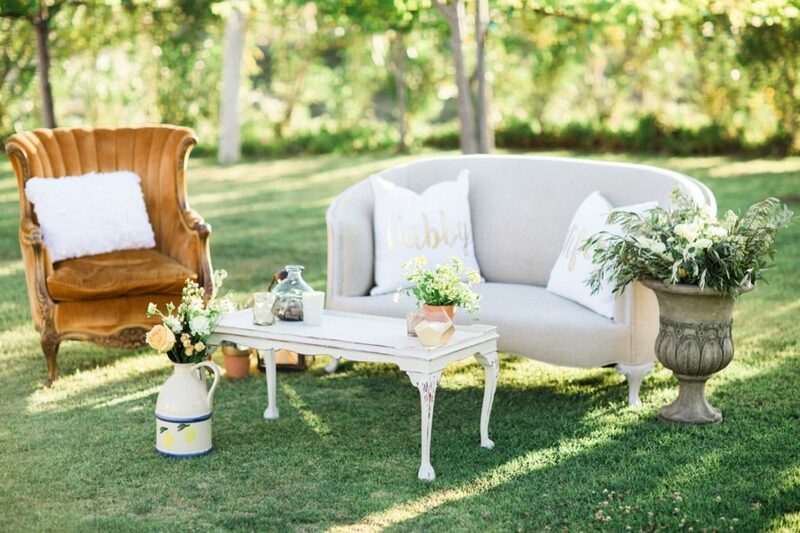 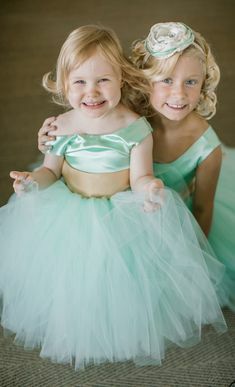 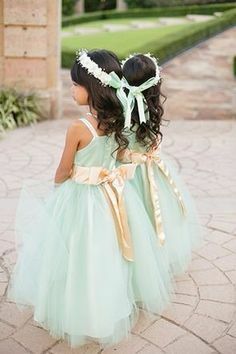 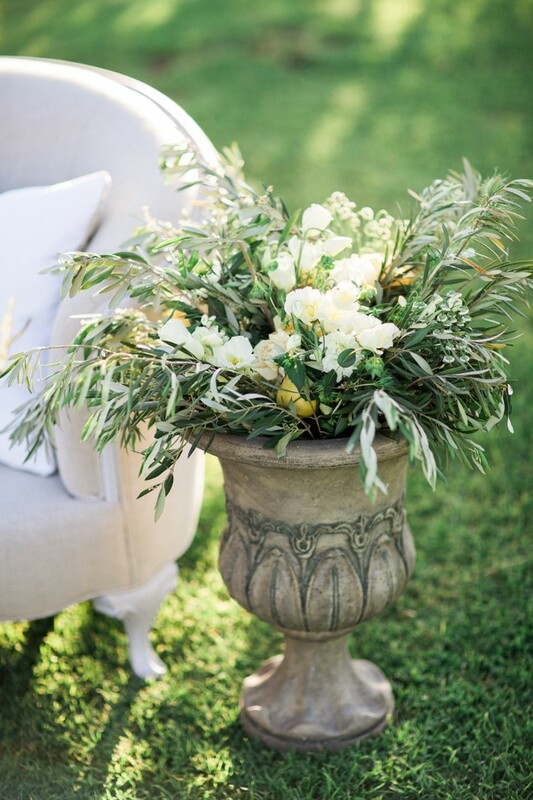 To supplement this family inspired Italian look was the sweetheart table. 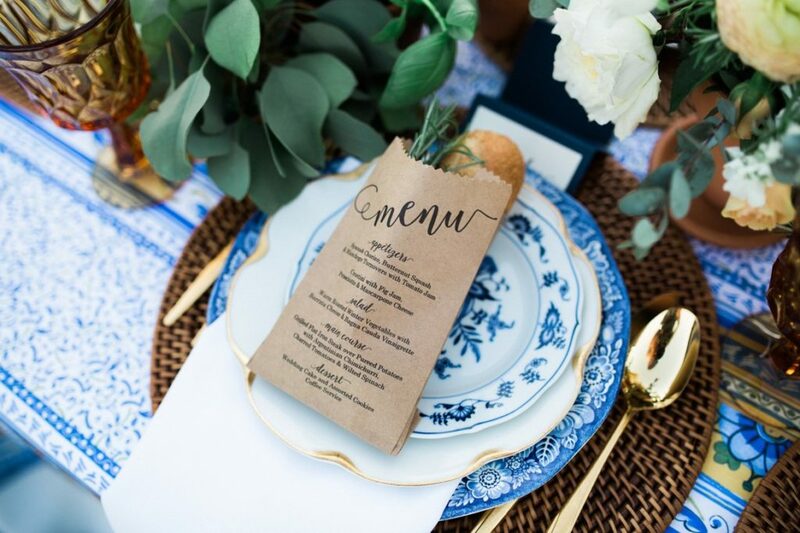 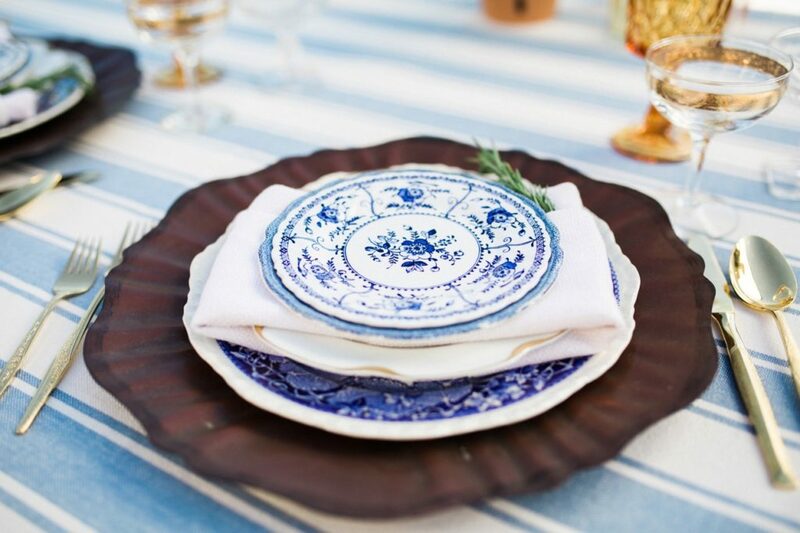 The rustic yet chic blue and white linen by Luxe Linen provided the perfect tone for the tableware and terracotta filled lush floral design. 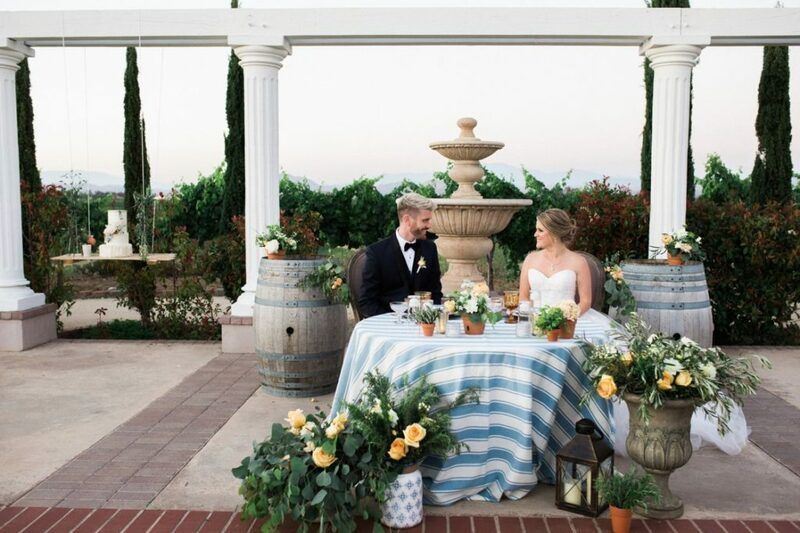 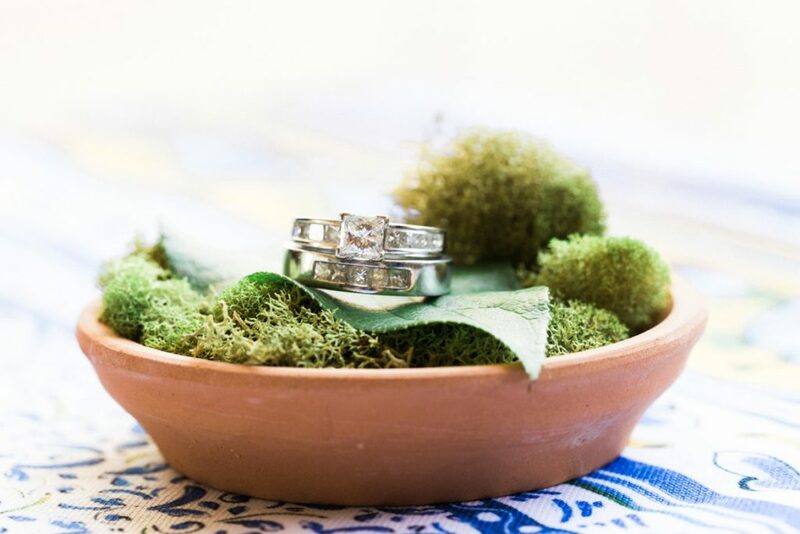 There was an abundance of greenery lining the front of the table with the winery providing its beauty as a backdrop. 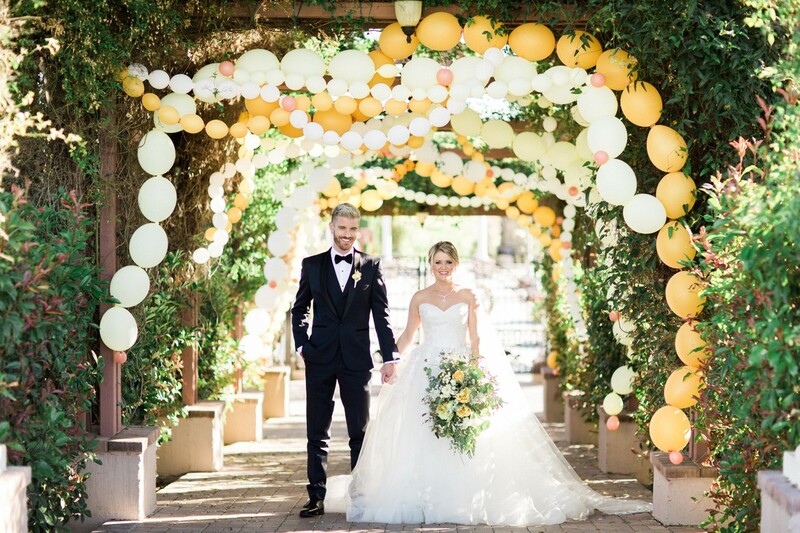 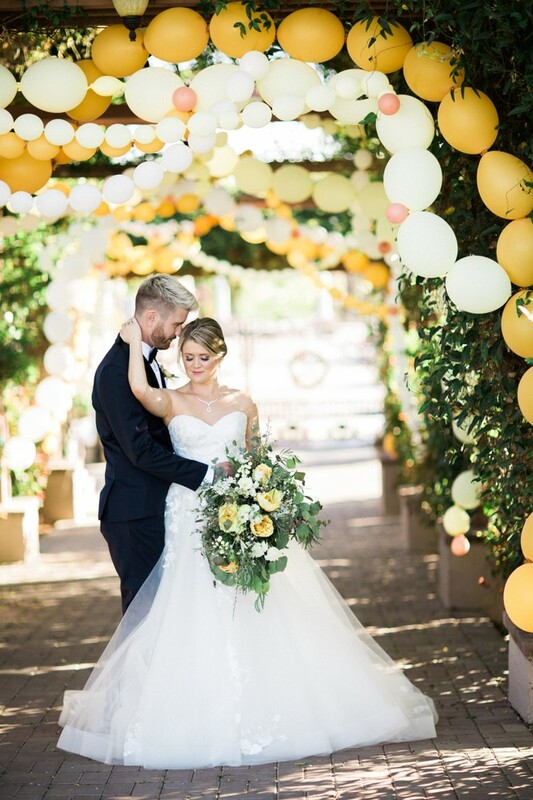 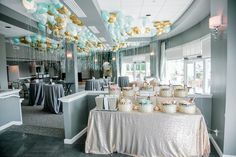 For a fun twist to the traditional bride and groom photos, the entryway of the outdoor reception venue was lined with flowing beads of balloons in a variety of blush gold and peach tones designed by Balloonzilla. 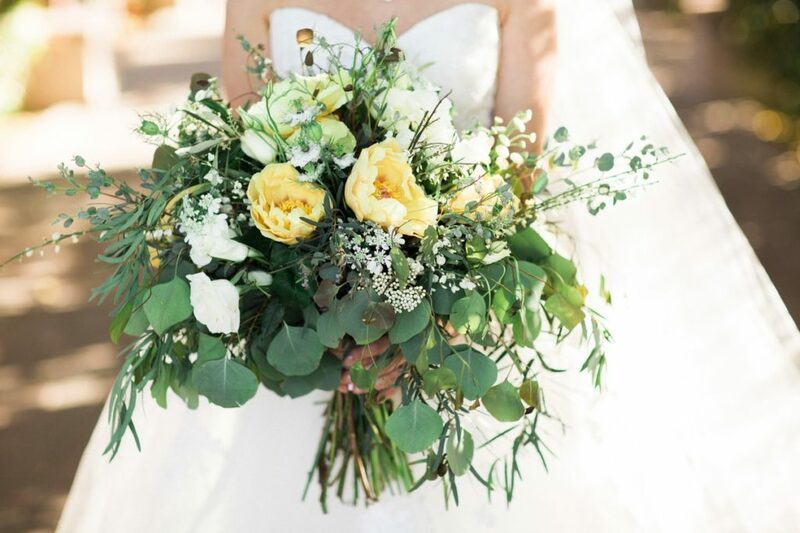 This provided a vibrant setting that accented the greenery and beautiful bridal bouquet while making a statement. 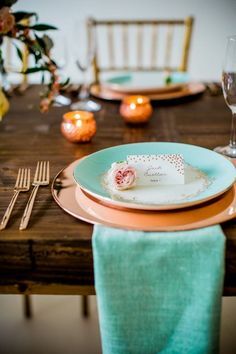 Creating a way to tie in the amber and peach colors along with the soft white bridal design, there was a vintage seating area with gorgeous furniture from Temeculas’ local Rickety Swank. 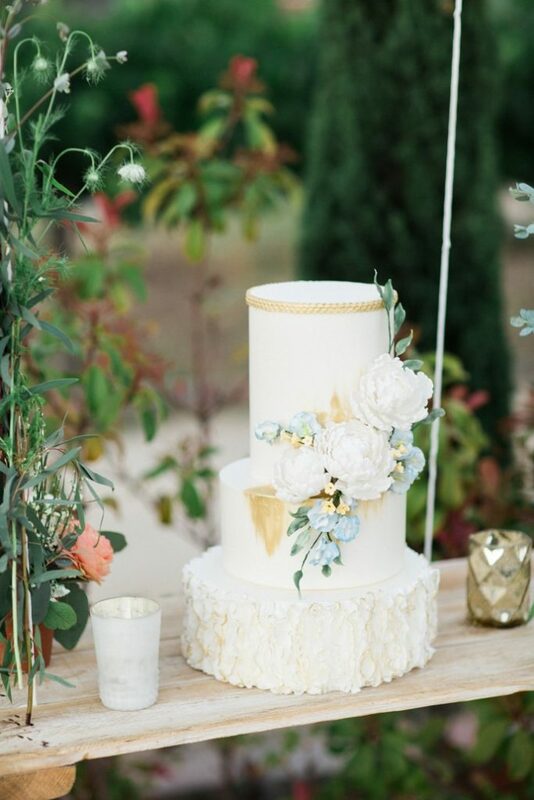 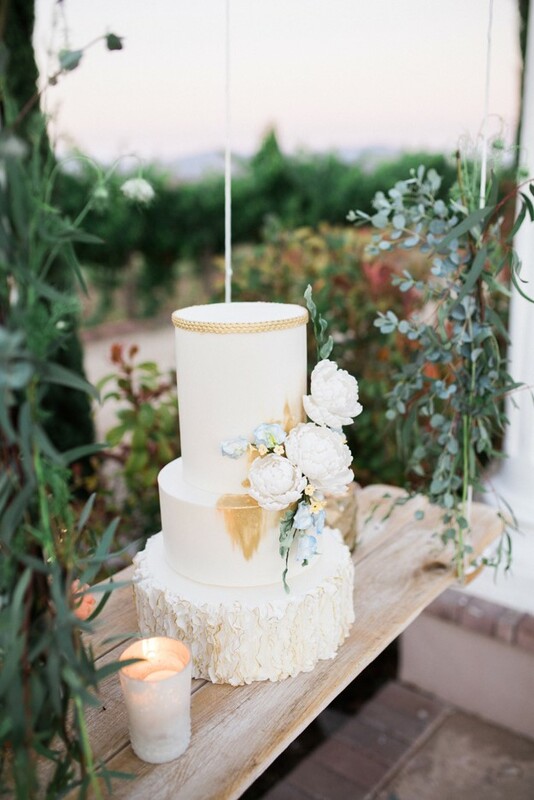 Truly Scrumptious Cakes by Beth created a cake that was romantic with delicate flowers and ruffles with a touch of greenery, blue and gold leaf. 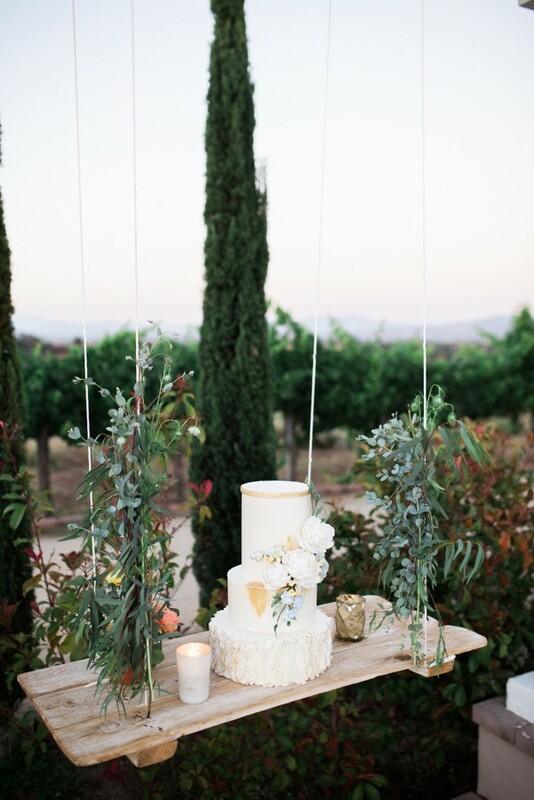 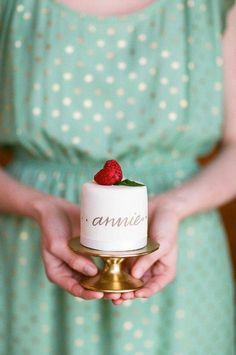 To provide a setting worthy of this cake, we suspended it resting upon a wooden plank adorned with greens and candlelight.